As Fantasmic! celebrated its 15th anniversary at Disney's Hollywood Studios, guests also had a chance to celebrate the debut of the Glow With the Show ear hats. The ear hats debuted last year at Disneyland and their appearance during Fantasmic! 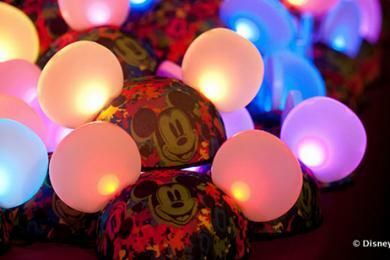 was just the beginning of all things glow ears at the Walt Disney World Resort. Using the latest technology, these magical ear hats glow and complement the imagery and beat of the fireworks and other nighttime entertainment spectaculars. Guests at the Magic Kingdom will have a chance to experience the Glow with the Show ear hats beginning October 19, when the hats will interact with Wishes and the Celebrate the Magic projection show. During the holidays, guests can wear their hats to the Osbourne Family Spectacle of Dancing Lights, Holiday Wishes: Celebrate the Spirit of the Season fireworks, and Celebrate the Magic projection show. The ear hats will also interact with other ears and settings around the Walt Disney World Resort. A set of Glow with the Show Ears is available for $25 at select locations in the Magic Kingdom and Disney's Hollywood Studios. I have a pair and wore them to Fantasmic think they will be better when more people buy them. They are quite small in size and sort of sit on top of your hear but they are really cool!